Forever toys offer playthings with interesting variety and something different that your parrot doesn't just chew up and destroy. While chewable toys are necessary for a bird's well-being, these creative toys and perches offer lasting play activity with moving spinners, parts that jingle, and other enhancements that provide stimulation and a welcome change. And they last so can be rotated to other birds in your family, or reintroduced to a single parrot. 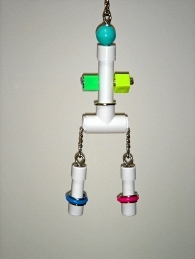 The Large Pull-Thru provides the same chain-pulling fun as the Pull-Thrus for smaller birds ... but this toy has additional PVC parts dangling from the chains which are interesting play objects for the larger parrots.